I remember watching him debut against the Aussies in 02 – coming into a team that had been given a wallop in the previous Tests. From the outside he seemed nerveless, aggressive, giving as good as he got. He looked more like an Aussie cricketer than a Saffa, which, I suppose in 2002, was the ultimate compliment. I remember the first double ton – lowly Bangladesh in East London of all things. A commentator said – when he gets in, he goes big. How true that became. Only two years older than me, I was always fascinated by how someone my age looked some grown up, so adult. Outwardly composed and so damn sure of himself, he gave me countless lessons on how to stand up and be yourself, back yourself and just go out there and do it. His first tour as captain – to the home of cricket. The country I had just spent a year in, and suffered mightily at the hands of Aussie and English mates following a diabolical year for SA cricket and rugby. I watched the toss, with Nasser throwing out that ill advised verbal jibe at the new captain on the first morning at the toss. He responded in the best way he knew. On the field. With his bat. Grim, determined, he churned out runs in that first innings. 277 of them. The more the Poms saw his ”technical deficiency” and attacked it, the more runs he made. First innings, and a marker had been laid. Biff was the Man to lead from the front, and compete with the very best of them. And as captain, he started becoming the team, from that very first day. Another double ton at Lord’s in the next Test, and he started threatening records set by Don. As in Bradman, the very best there was. A legend had been born. As a student, my time was my own, and I watched every single day of that five test series. And revelled in it. Nasser quit, and we were impressed even more by his iron will. Little did we know that it would become Biff’s English tour circus trick. I watched his first test ton on SA soil as captain live at the Bullring late that year versus the Windies. He got off the mark with a trademark whip through midwicket from a ball delivered by Bravo that was pitched on off stump. Laid a marker out in the first over, and we just knew he was going to make a big one. Fitting for the occasion. Incidentally, I received my first year final exam results that same day, via SMS will sitting in the stands watching Biff live. Pass, just going to show that all that time watching Biff was well spent. I watched plenty of his innings since then, huge opening stands with Gibbs, a memorable one with Mackers to save a Test at Lords, big runs on the subcontinent, that 100 in Perth against the Aussies in 2008, the truly stupendous, breathtaking, undefeated ton to win the series against the Poms in Birmingham (#2 Vaughan), another 4th innings 100 against Australia in CT, his part in the famous 438 game, a blitzkrieg T20 assault when the game was in its infancy at the Wanderers, a 100 on the losing side against the English at Centurion, when Strauss spitefully refused him a runner, another ton at the Oval in his 100th test to set up another series win and take care of #3, Strauss in 2012. Critics and purists bemoaned his technique, his lack of style, but I loved it. Effective and brutal it could be, yet I know I’ve seen him cover drive the world’s best for boundaries the world over. Beside, he got the runs, he got the big runs when we needed them and I for one could not care if he scored 100% of them between square leg and mid on on the leg side. Through all this, he was the Test captain, and opening bat. Coaches, opposition, conditions, politicians, personal strife – you could rely on Smith. And if you needed a games saved or won against insurmountable odds, let him know. He seemed to thrive on it, and has a record in successful 4th innings chases that is head and shoulders above the very best in the world EVER. Yet somehow, SA fans in particular did not warm to him. I’ve lost count of the number of die hard SA cricket fans who I’ve argued with for hours over Biff, who genuinely seem to despise him. Personally. As if they know him. Despite the incredible things he has done on and off the field as a batsmen and captain. Opposition teams and supporters always seem to hold him in higher regard than his own, and that will always puzzle and frustrate me. GC Smith, walking out to bat at #11 with his hand in freshly set plaster to face Johnson and Co on an uneven Sydney pitch with the series already in the bag. Spine tingling, heart warming. It won over some of the most crusty Aussies fans I’ve ever met, and summed up Biff and how he viewed his team far better for me, than anything that could ever be written or said. Fair, honest, yet competitive to the end, humble in both victory and defeat, Biff finished with more than 100 Test as captain, an average as an opening bat of more than 48, an extraordinary unbeaten home and away Test record as captain, and the respect and admiration from almost the entire cricketing world. Including me. I’m not sure how to tackle SA test cricket without him at the helm. But he’s taught me a thing or three over the past 12 years, and I’ll battle through. I’ll miss him, more than should be healthy considering I’ve never met the man, never said a word to him apart from sending him congratulatory Tweets occasionally. Let’s be fair – travel writing is not quite for me. For the simple reason that I really struggle to write anything while travelling – apart from some notes using a good old-fashioned notebook, I’m loath to see a keyboard when travelling. Yet, once I’m relatively settled – well, that’s another story. To ease myself back into this, I’m going to cheat slightly – here’s an article I wrote recently for Suite101 – first published here. Heavy on facts and light on story – still, informative is what they’re all about. Exploring Australia’s oldest and largest city does not have to break the bank, with numerous options available for the budget conscious traveller. Explore Australia’s oldest city on the cheap. An excellent way to get to know the city is to take a free walking tour with I’m Free. Departing from the anchor beside Town Hall on George Street daily at 10:30 am and 2:30pm, friendly and knowledgeable local guides will show you round their city and share some local tips on what to see and do in Sydney. A variety of museums, galleries and other attractions are free to visitors and are great for those looking to explore the cities history or get a local culture fix. The Rocks Discovery Museum (10am -5pm daily) brings the history of the area to life, with exhibitions from the pre – European days to present time in four excellent permanent exhibitions. The Australian National Maritime Museum (9am – 5pm daily) in Darling Harbour is a great attraction for both young and old and brings Australia’s rich maritime history to life. The Australian Centre for Photography (Oxford Street, Paddington), Art Gallery of NSW (across the expressway from the Royal Botanic Gardens) and the Manly Art Gallery (Manly West Street, Manly) have wonderful local and foreign exhibitions. For something a little different, pay an early morning visit to the Sydney Fish Market (auctions from 5:30am) in Pyrmont to watch the market in full swing. The Royal Botanic Gardens (7am to Sunset daily) offers an exquisitely maintained, quiet, green getaway right next to the CBD. Head for Mrs Macquarie’s Point for some of the best views of Sydney’s harbour, including its two iconic landmarks, the Sydney Opera House and the Harbour Bridge. A free bus service – number 555 – runs a loop from Circular Quay through the CBD to Central Station along George and Elizabeth Street, running every 10 minutes in both directions. This service runs from 9:30am – 3:30pm (and until 9pm on Thursdays) and from 9:30am until 6pm on weekends. Some of the best views of Sydney are undoubtedly from the water. Instead of taking an overpriced sightseeing boat tour, catch the return ferry from Circular Quay out to Manly. Each way takes roughly 30 minutes and a return trip costs $13.20. Offering excellent views of the Opera House, Harbour Bridge and other harbour attractions such as Watson’s Bay and Fort Denison, this is definitely a must do while in Sydney. Some of Sydney’s best, and most affordable dining can be found in Newtown and Chinatown. Newtown, a student area close to the University of Sydney offers cheap Thai food and is a trendy, funky area with plenty of cafes and bars. Chinatown, behind Central Station offers a smorgasbord of Malaysian, Vietnamese, Thai, Chinese, Japanese and Korean at affordable prices. Close to Circular Quay, Ship Inn offers $10 pizzas on Monday and Tuesday, while The Orient in the Rocks offers a $10 bar food Monday. Lastly, but certainly not least, travellers in Woolloomooloo will find a Sydney institution on the waters edge. Renowned for its 24 hour service, affordable and tasty meals, Harvey’s Café de Wheels has been serving Australian favourites like pies, mushy peas, mash and gravy since 1945. 3. Had a great year teaching English in South Korea. 5. Ate live octopus tentacles and the infamous dog meat at staff dinners. 8. Had a beautiful tailored suit made while on a shopping frenzy in Hoi Ann. 9. Got my Masters Degree in Economics. 10. Had epic nights out with friends in Johannesburg, Nottingham Road, Hongdae, Boryeong and Paju. 11. Watched proudly from afar as SA hosted an excellent World Cup. 12. Made some wonderful new friends from around the globe. 13. Swam in the South China Sea. 14. Walked along the Great Wall of China. 16. Celebrated a birthday with a braai and a noreabang!! 17. Took part in two festivals, one as a mourner, and one as a scantily clad white Zulu. 19. Moved house and country. 22. Had a motorbike accident. 24. Bought tickets for the Philippines, Shanghai, a Kings of Leon concert, the 2Oceans 21km in Cape Town and the Rugby World Cup in New Zealand. Bring on 2011!!! So, southwards, from Hanoi to the small town of Hoi Ann, rather neatly about midway between Hanoi and HCM city. But first, we have to get there. Planning on catching the train, we found that full. Next option, a 24 hour bus trip. In South East Asia. This did not sound appealing. But, with few other options, bus it was. Thankfully, it was not nearly as bad as it could have been. It fact, it was almost pleasant. The bus was modern, clean, did not break down, and it was a bona fide sleeper bus. It actually had ‘bunk beds’ for lack of a better word in the bus. That fitted my 6 foot plus frame. Bliss. Leaving Hanoi around six, Hue was reached around 8 the next morning. And thanks to the bunk beds, we slept most of the way. Although I was fortunate enough to wake at around 3 in the morning and catch a glimpse of some Vietnamese rice paddies, ghostly and beautiful under a full moon. Pity the camera was not close at hand. At Hue, we had another unexpected surprise. We had a layover in this ancient imperial city for around 6 hours, before our 4 hour bus dash to Hoi Ann, so technically it was not a 24 hour bus journey. What a blessing. 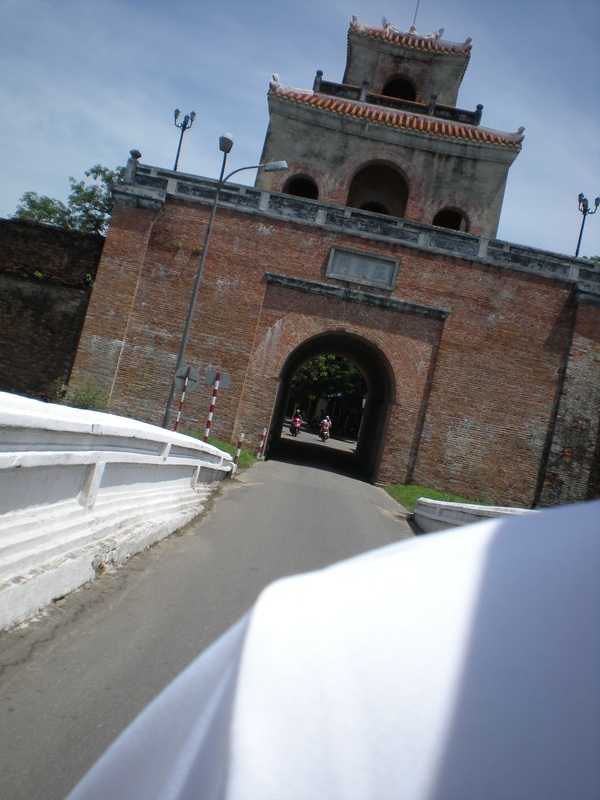 The wall of the Imperial Citadel from the back of a moving motorbike. Next up, a short cruise on the back of the bike along the banks of the Perfume River to the Perfume Pagoda. The site of a functioning Buddhist monastery , it has a fantastic view over the Perfume River, and the Pagoda itself as gold images of Buddha on its base. An atmospheric and beautiful Pagoda, and well worth the visit. Our briefest of brief visit over, it was back to pick up our bags, cadge a quick shower and back on the bus. For Top Gear fans this is the stretch of road that the presenters ogle over in their Vietnamese special, and rightly so. Dropping down to the coast in a series of hairpin bends before opening up on magnificent lagoons, this is some scenery you do not wan to miss. It’s also the first spot I’m visiting next time I’m in Vietnam. Anyway, finally in Hoi Ann. We found a cheap hotel, and hit the streets in search of dinner. With a couple of friendly Dutch girls we found on the bus trip down, we holed up in a little restaurant, and took it upon ourselves to sample as many of the local delicacies as possible. Thankfully, nothing on the menu was more than $4, so for once this was possible. It did not hurt either that they were selling locally brewed beer at the mind-boggling price of VND4000 ($0.25) a glass. Needless to say, the meal was well washed down, and thankfully the Dutch know how to hold their beer. I had a feeling I was going to like Hoi Ann. Right, where was I? Oh yes, we were just leaving Hanoi after a wonderful few days, heading for the UNESCO World Heritage Site, and gobsmackingly beautiful Halong Bay. 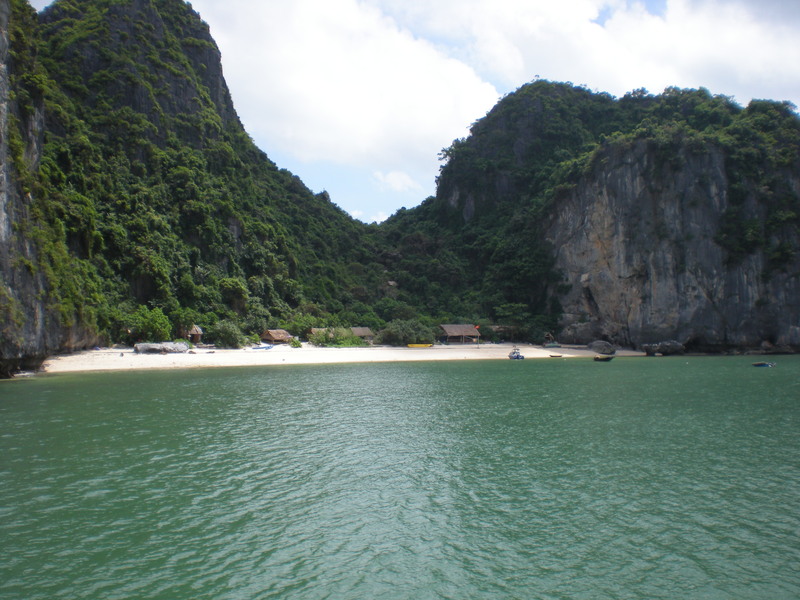 On the north-eastern edge of the country, around four hours from Hanoi, the bay is very firmly on the tourist trail, and you’ll be hard pressed at times to avoid the crowds, even outside of peak season. It is possible however. 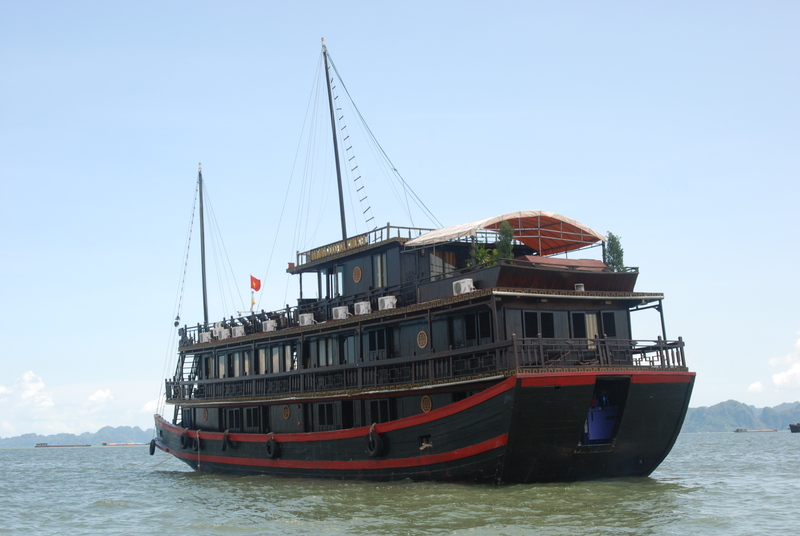 Hanoi is literally teeming with travel agents who will organize a one in a life time trip out to the bay, sometimes for as little as $45 per trip. However, be warned, you will definitely get what you paid for here. It might be worth paying that little extra and going with a reputable tour company. It is possible to do the bay under your own steam, and if you have no time constraints, I’d say go for it. Anyway, on the advice of a few friends who had been in Hanoi a year earlier, we booked a 3 day trip with Hanoi Backpackers. Although they have a bit of a rep as a party outfit, they are incredibly organised, and if you’re of the travelling variety where you prefer people to hold your hand and point you in the right direction, then theses guys will make your travels a breeze. For a price of course. Only once we had navigated round the masses, and hopped on a little tender to take us out to our junk, rather boringly called the Jolly Roger could we begin to appreciate the beauty and splendour of the place. According to our junks skipper, which rather conveniently tallies with all knowing Wiki, “when the Vietnamese were fighting Chinese invaders, the gods sent a family of dragons to help defend the land. This family of dragons began spitting out jewels and jade. These jewels turned into the islands and islets dotting the bay, linking together to form a great wall against the invaders. The people kept their land safe and formed what later became the country of Vietnam. After that, dragons were interested in peaceful sightseeing of the earth, and then decided to live here.” Lesson endeth. Now that you’re educated, let’s move on. We said goodbye to the hordes, and went steaming into the bay, thankfully in a direction opposite to most of the other boats.. Beer in hand and up on the top deck, it was difficult to chat to any of the fellow backpackers on board, because the views on offer were just too distracting. 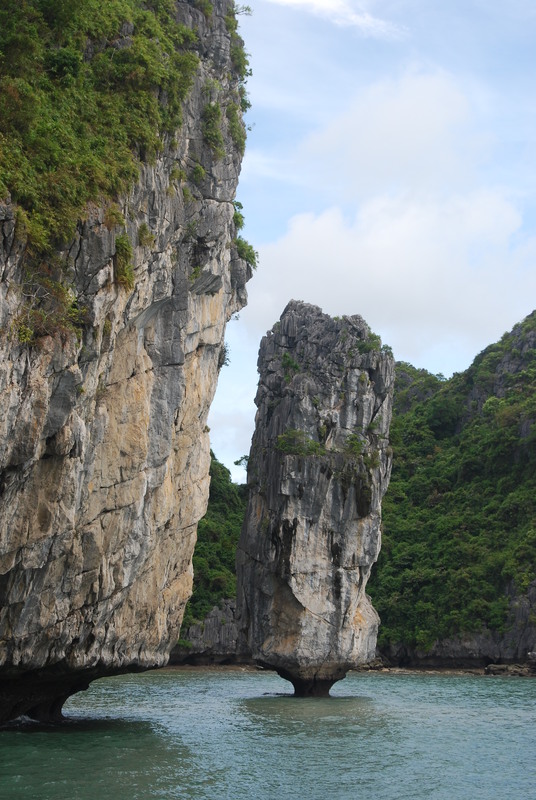 Limestone cliffs that seemed to defy gravity were dotted all over the place, and they seemed to hide so many little bays and inlets that it would surely take years to explore them all. With hardly another boat in sight. The views were so good I had to be called twice for lunch. A mistake I only made once. Prawns, grilled fish, fresh fruit and veggies, beef stir fry. And endless quantities……Rarely have backpackers eaten so well. It was just as well we fueled up. The afternoon was passed in a blur of activity, jumping off the top of the junk into the waters below, a kayaking trip through the caves and tunnels, and a little light caving. 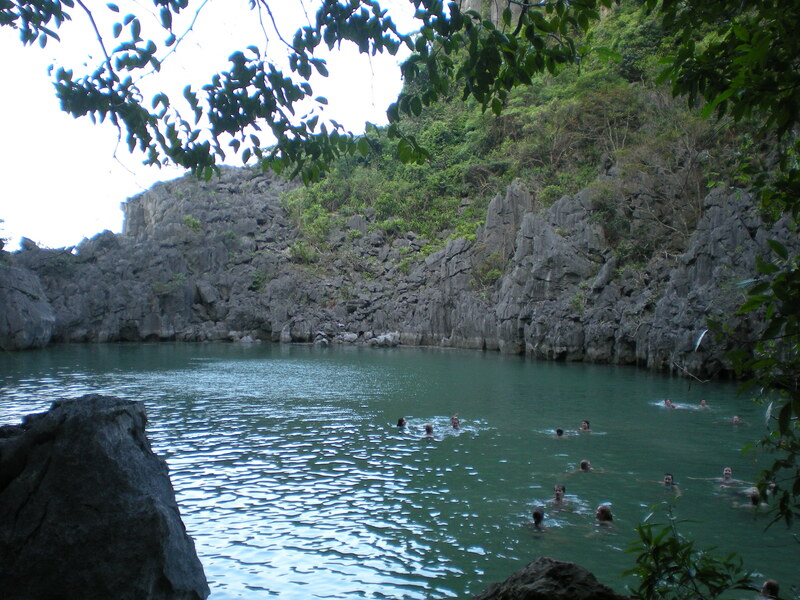 Once we had all wriggled our way though the cave, we came out into a hidden pool of water, totally surrounded by the tall limestone cliffs. It looked like something straight from the movies. Floating in the warm water looking up at the sky was the most epic way to pass a Monday afternoon. That evening was spent under a full moon on the deck of the junk, after yet another wonderful meal and a few cold beers. Mercifully, the few other junks that were moored in the same bay were well scattered, so it was quiet and peaceful, and truly beautiful in the moonlight. Bright and early the next day, we transferred onto a smaller tender, and set off for a two hour cruise deep into the heart of the bay. We passed a few of the local, floating fishing villages, and saw some of the fishermen in action. 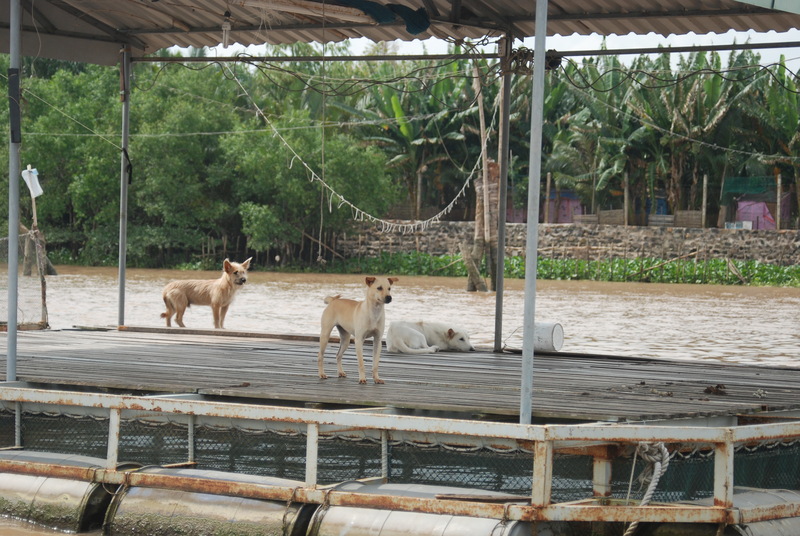 Almost all of the little floating villages had a few dogs living on them, and as our skipper explained to us that the dogs are used for security when the family goes out to fish. They, like the fisherman will hardly ever go onto dry land, and will spend most of their lives on the water. Stay tuned for the next installment. 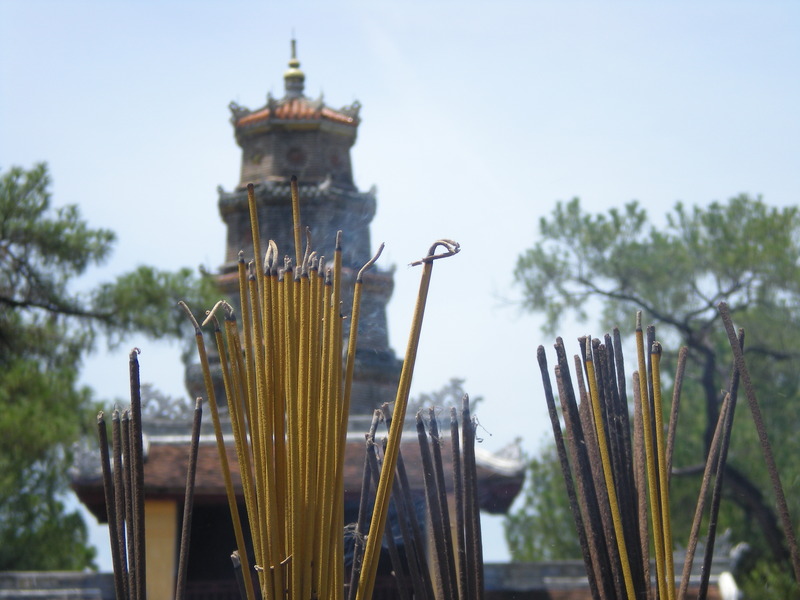 Hue and Hoi Ann…. As I write this, I’m on the night train, slowly chugging south towards Saigon. Admittedly, I am only posting this post several days after the fact, yet that sentence just seems to impossibly romantic not to include. But wait, I’ve skipped too far ahead. Allow me to backtrack a little. 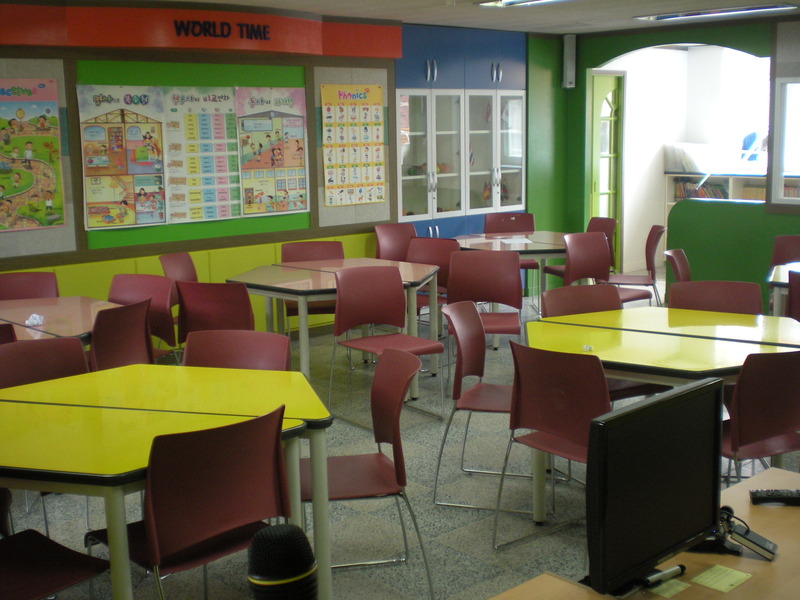 Summer means holidays in most parts of the world, even in the Korean public school system. Two weeks of freedom to go and explore a new part of Asia. Myself and a couple of fellow teachers who had coinciding holidays choose to visit Vietnam, around a 4.5 hours flight from Korea. A country that is perhaps better known as a war than an independent state (at least in the west), I was not sure what to expect. And yet, and expectations I had were completely surpassed one hundred times over, and then some. 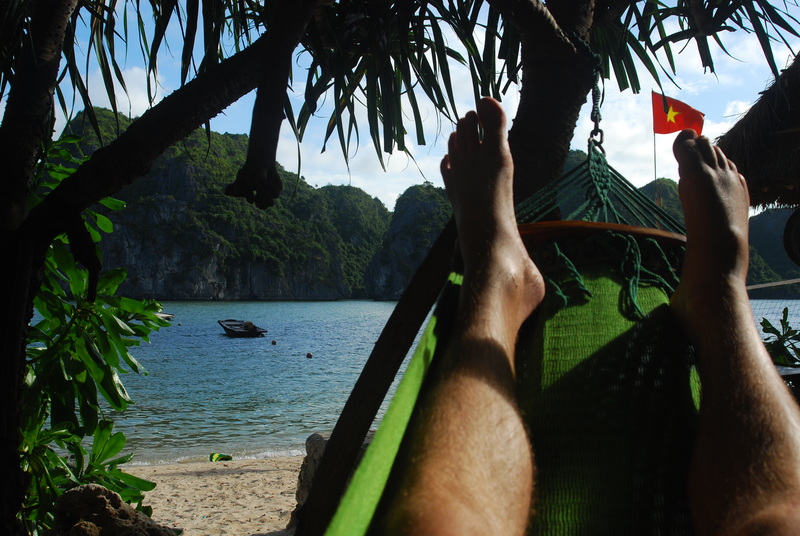 I only hope these blogs can do some justice can adequately convey just how wonderful I found Vietnam. Saturday saw us at Incheon airport, eagerly awaiting our Vietnam Air flight into Hanoi, the Vietnamese capital. As chance would have it, some friends were heading out to Cambodia at the same time as us, and yet more friends were flying to Beijing, so we all had a celebratory breakfast before we scattered off to our various holiday spots. On the flight, for once, instead of being seated next to a crying baby, or an obese sweaty man who has no concept of personal space (oh the joys of flying) I found myself next to a gorgeous Korean girl. Unfortunately, she was seated next to her father and mother. Equally unfortunately, she spoke barely a word of English, and I’m not much better in Korean. Oh well, next time perhaps. Anyway, with all thoughts of a holiday romance shot down before they could even get going, we land in Hanoi. Despite being Vietnam’s capital, Saigon in the south is the country’s economic powerhouse, and Hanoi is consequently much smaller than its big sister in the South. This is clearly illustrated in the airport, which is small and bland and reminds me of East London’s airport. Equally surprisingly, although this was a pleasant surprise, was the weather on arrival. While hot, it was not unbearable, and while humid, is was nothing special. After Korea’s humidity, this was a piece of cake. 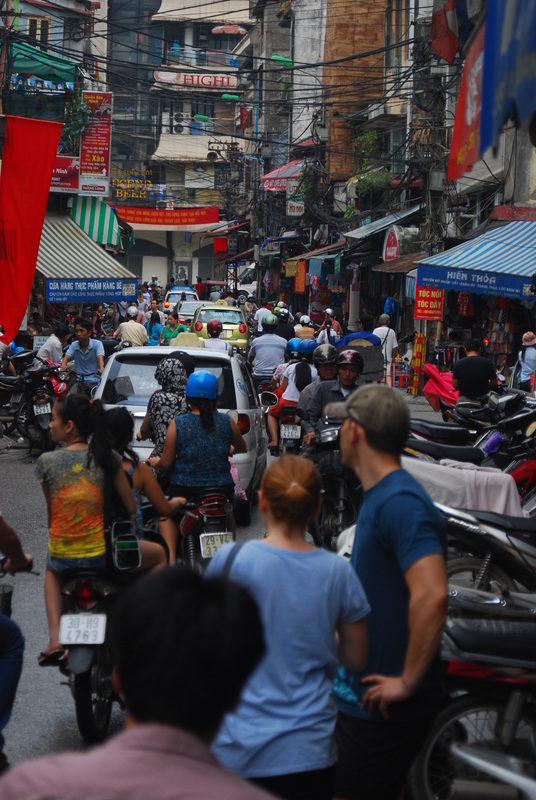 A bus trip took us into Hanoi and dropped us off on the edge of the old quarter of Hanoi. The ride in had given us our first taste of the crazy traffic, with thousands of motorbikes, hooting everywhere and what seemed like chaos going on everywhere. It was almost (and I stress almost, more chaotic than Cairo’s traffic). Somehow it seemed to work though, and within a few days we hardly even noticed the crazy traffic. We found accommodation at the Viet Fun Hotel, in Ngo Huyen Street, just a few blocks from Hanoi’s famous Old Quarter. We were headed for the backpackers just next door, but who would say no to their own private room and bathroom for just a $1 more than sharing a dorm? 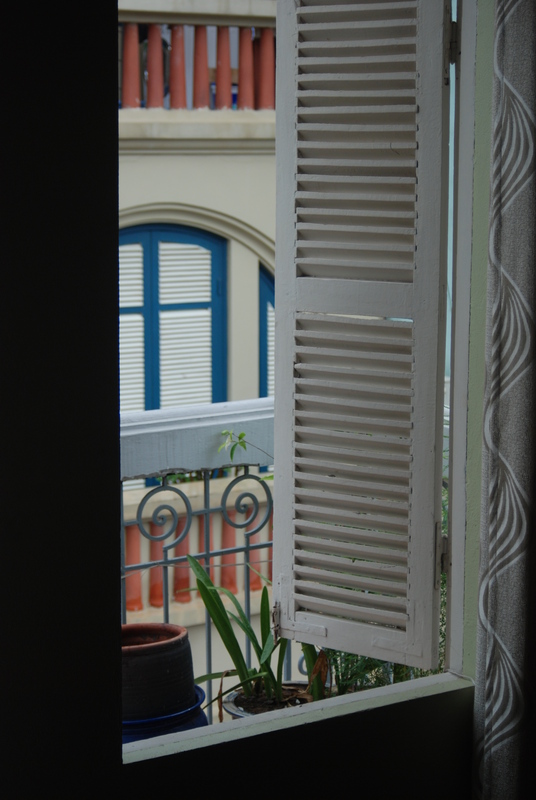 Especially a room with a balcony overlooking the colourful streets of Hanoi. Settled, it was off to hit the streets. 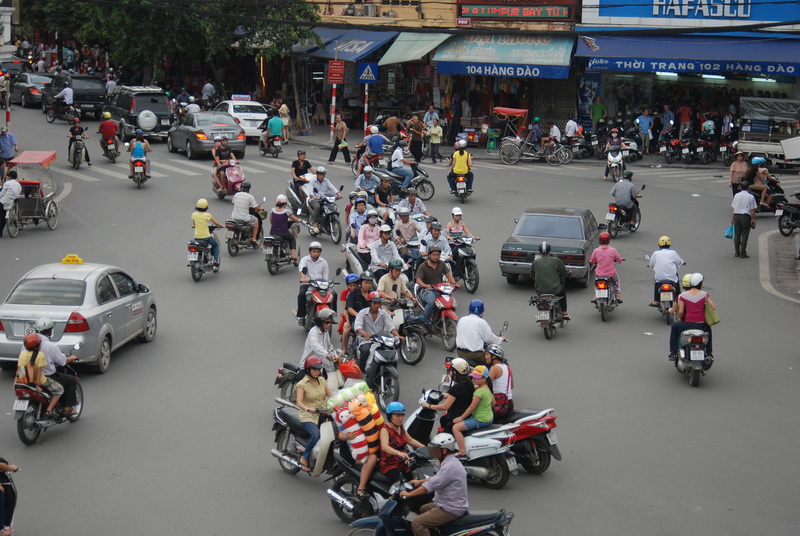 Noisy, bustling with people, motorbikes everywhere, it was chaotic. And wonderful. The more we wandered the town, the more I liked it. Once we had figured out how to cross the streets (simply plunge in, and walk steadily, no running, the motorbikes will avoid you) we did some shopping in the Old Quarter, tried to eat everything we saw, visited a few attractions and reveled in being somewhere new. One highlight of Hanoi, and one the continued throughout our trip , was the food. Especially after 5 odd months in South Korea, the use of fresh herbs like mint, basil and lemon grass to namebut a few was wonderfully refreshingly, as was as the abundant supply of fresh fruit and shakes. All at knock down prices. It really was bliss. A firm favourite was quickly discovered in the form of Pho bo (thick beef noodle soup) with its generous mint flavours. Sold just about everywhere, the best I had was one night on the street corner. Seated on tiny wooden stool,quite literally cheek to jowl with the other customers a large bowl of pho and bread, all for the princely sum of VD20 000 (around $1). A definite must next time you find yourself in Hanoi is the Hoa Lo Prison. More commonly known as the Hanoi Hilton, the was the prison that most recently housed downed US pilots during the Vietnam war. 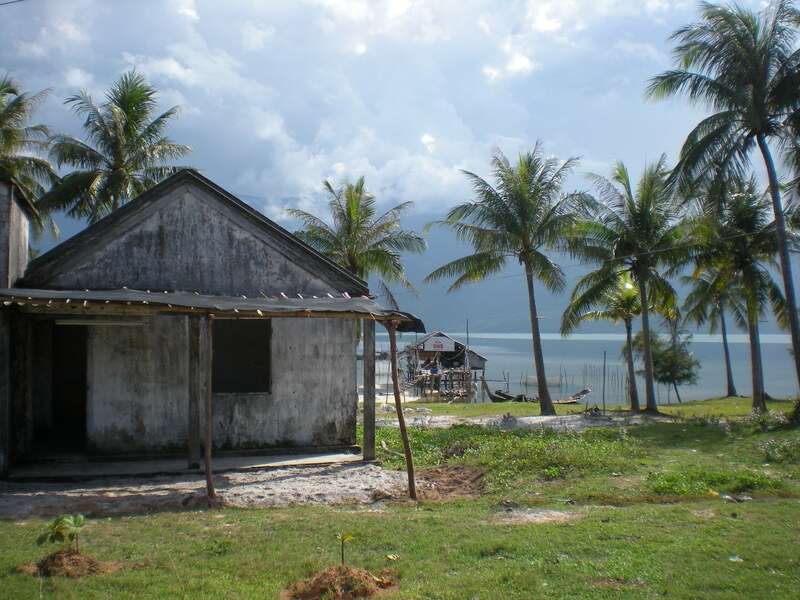 However, it has a long history prior to that as a detention centre that the French used during their occupation of the country prior to WWII. Expertly done, the museum is an excellent place to wonder for an hour or so, and tells an interesting, if rather one-sided view of the Vietnam struggle for liberation. Definitely well worth a visit. 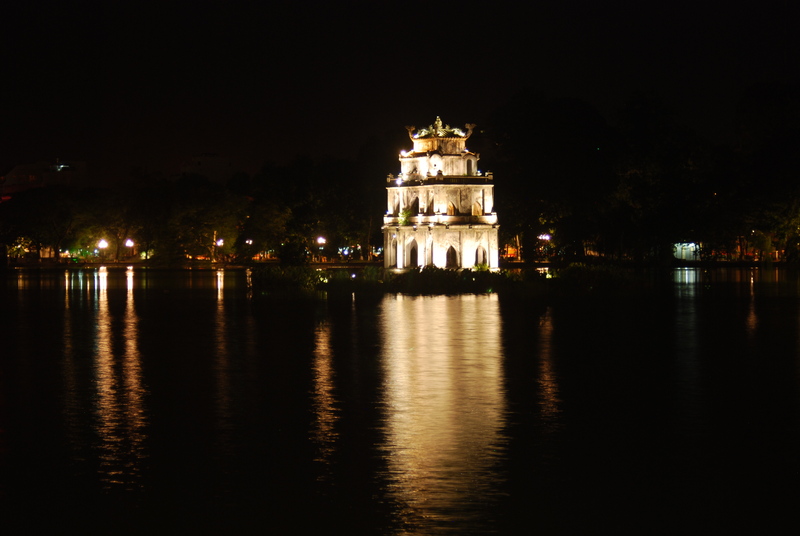 The French influence on Vietnam is particularly evident in several spheres, most notablyin much of Hanoi’s architecture. Of much more importance to me however, is the food legacy that they left behind. Imagine, after five months in typically Asian Korea, finding real bakeries. With fresh baguettes, croissants and cheese. Loads of it, in all sorts of varieties, everywhere. And at wonderfully reasonable prices as well. My only regret is that I didn’t have more if it while I was there. We found an awesome bakery right next to the UN buildings in Hanoi, and I am actively looking for a job with the UN in Hanoi so that I might be able to have lunch there every day…. After four wonderful, and all too short days in Hanoi, it was off to Halong Bay. 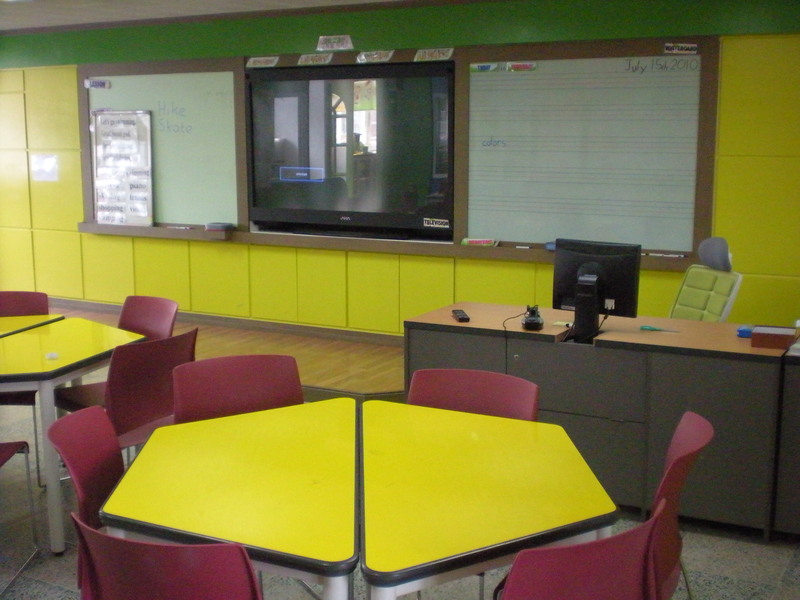 Coming up in the next installment…..
A Day in the life of an Englisheee Teacher in South Korea! It’s just after 7, and the alarm rather rudely wakes me. Even with the fan, which has been going all night ( I would much rather risk the infamous Korean ‘fan death’ than drown in my own sweat) and the fact that it’s still relatively early, I can feel the heat and humidity starting to build. Its summer in Korea, and while it never gets incredibly hot (30 degrees C is pretty standard) the humidity is a killer. You don’t so much as walk down the road as you do swim through the atmosphere that is incredibly thick and muggy. While I prepare myself for another day, I put on the TV to BBC News. It’s vaguely reassuring to hear the familiar English drone in the background, and to catch up on the previous days news. A simple, western style breakfast of toast and juice, and its out the door for another day as an expat Enrisheee teacher just outside of Seoul, South Korea. Mercifully, the walk to work takes all of two minutes. After far too many wasted hours spent commuting in Johannesburg, I really appreciate the fact that the door to door commute takes less time than it does to eat my breakfast. Yet, even on such a short work, I am exhausted by the time I reach my office. And it’s nothing to do with the weather. As a minor celebrity (as are most foreigners in Korea) I lose count of how many ‘Hello teacher” and “Hi’s” I respond to, of how many high fives are handed out and how many children try climb me like a regular jungle gym. Teaching Elementary school is not for the faint hearted. And it’s straight into it for me. Before school officially starts, I begin my tour round the Grade 1 and 2 classes, spending barely 10 minutes with a couple of classes per day. At that age (7&8 years old) is mostly chants, songs and clapping, a very familiar theme that will run through the rest of the teaching day. Classes start at 9, and first up, a Grade 5 class. Today we’re doing actions and verbs, so we run through a list of vocab (swimming, hiking, skating etc) before we learn our daily song complete with clapping and actions. This working environment could not be further from the previous job at a financial consulting company, and for the change alone I’m grateful. My school is fortunate enough to have two large English rooms, complete with posters of iconic monuments from across the western World, and everywhere you look are posters and pictures with English written on them. The point is total immersion in English as a language and culture, which is why I happen to be standing in the room. Unfortunately, my co teacher for this particular class is always rather quick to switch into Korean when that familiar look of confusion crosses the kids faces, but it’s well worth it to have her in the room with me. You try explaining the difference between swim and swimming to 35 11-year-old Korean children without using just a little Korean… go on, I dare you. Thankfully, I love Korean food. And just as well. Every day is an adventure, never not quite knowing what I’m going to find. these meals are heavily subsidised, and cost me almost nothing. They’re a great way for me to try to discover new Korean dishes, and not having to prepare any lunch for work is a great boon for me. The previous foreign English teacher that I replaced apparently was not a big fan of Korean food, so my Korean colleagues are often quite surprised by how much I enjoy their food. Although, my chopstick skills do leave a lot to be desired, especially with the wicked round style metal chopsticks that are much more slippery than the traditional wooden ones. While my skills they have improved over time, disaster does still strike occasionally, sending them into fits of laughter. 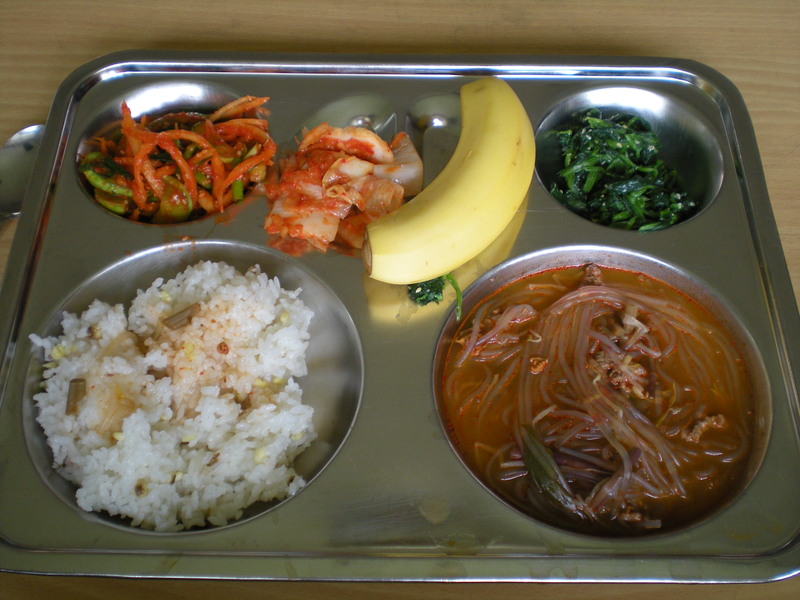 Lunch: Rice and Kimchi (as usual) plus noodle soup and diced veggies. Afternoons are reserved for prep time, with the occasional extra lesson or focus class meaning more time back in the classroom. For the most part, this is mostly free time for me and most foreigners in the Korean public school system. With very limited Korean ability, and no home room class to administer, admin is mercifully almost non-existent. This time is devoted to reading, writing, planning my next weeknd jaunt, or the upcoming trip to Vietnam. Also, folks back home are just waking up and starting their days, so it’s a good time to contact those back at home. Add in some English lessons with my principal, prepping some of the kids for an upcoming speech competition, and the odd game of soccer with some of the kids before the head off to their hawgwons, and it’s usually a pretty relaxing afternoon. Come 4:30 and that’s a wrap folks. A quick stop at home to pick up my dobok, and it’s off to Taekwondo practice. Just down the road, I practice with mainly elementary students since I’m a virtual novice. Not only is it a great and new way to keep fit, it’s also quite an eye opener for me. Considering how much I struggle to learn Taekwondo when its taught to me in Korean, I am able to get a feel for what most of the kids must feel like in my classroom. Despite the language barriers, I’ve just recent passed my first Taekwondo test, moving on from the novice’s white belt to the yellow belt. And no, I’m sure I got no special treatment at all because I’m a waeguk…. 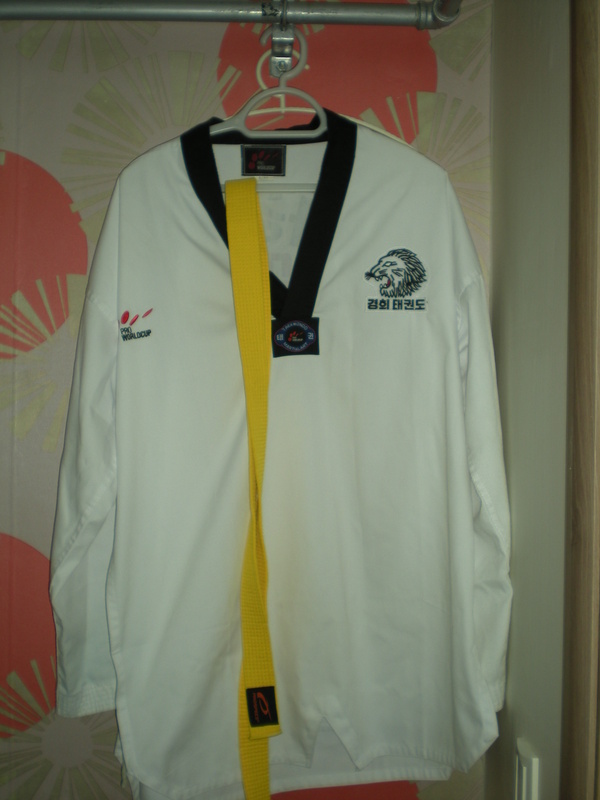 Taekwondo gear. Note the yellow belt!! Home for a shower and then I’m off. Sometimes it’ll be a quiet night in my neighborhood, visiting the gimbap lady for dinner and trying to improve my Korean with the locals over a beer outside the convenience street. Other times I’ll be catching a bus for the 15 min trip to the nearby CBD area to meet up with a few other expats to grab some dinner. Due to the excessive humidity during the day, night-time is when things happen in the summer, and the restaurant and bars are all open late. Just another day in the life of an Englisheeee teacher in South Korea. We all know just what a wonderful and special man Nelson Mandela is. Specifically, we all know just how important, and indeed, absolutely vital he was to ending apartheid in SA, and ending it in a relatively bloodless way. Yet I’m not sure South Africans are always aware of just how much the rest of the world looks to him as well as a truly great man. My example is this. At my relatively small Taekwondo school all the way over in South Korea, they give the students a monthly newsletter, usually dealing with tournament news, trips etc. This month, there was special twist. they had an article dedicated to Mandela and the 67 minute volunteer programme that gets promoted during July, the month of his birth. 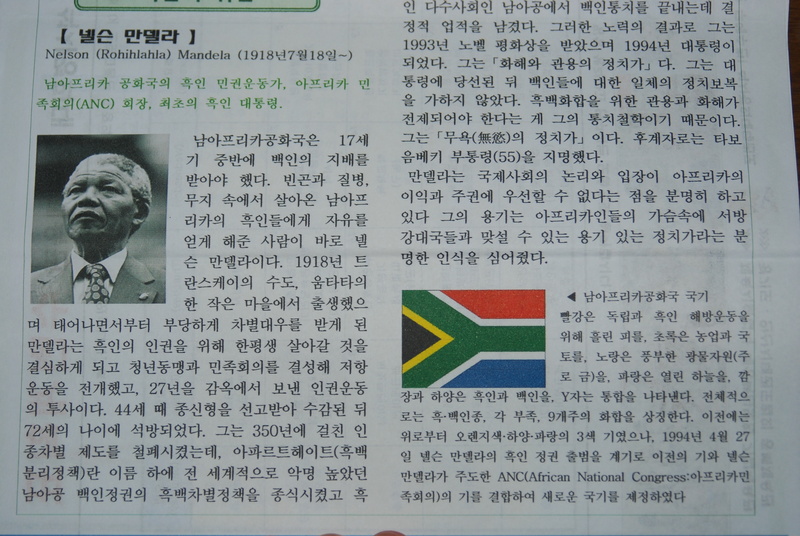 So, splashed across the newsletter of Hangul characters is a picture of Mandela and the South African flag, and a plea to follow his example of humility, and devoting your life to the betterment of others. I had never been prouder to be South African than when I first saw that newsletter. I wish my country was always associated with things as wonderful as him. For once during my time here in SK, I woke this morning with nothing to do. No where to be, no bus or train to catch, no admin to be done, or people to meet. Just me and my book. There is a small, but thriving book swap amongst some of the English teachers in my city, so while you may not have much choice over what you read, there is content available. Additionally, the local library has a small, yet very well stocked English section. Unfortunately, it is reasonably far from where I live, and not on any convenient bus routes, so I have yet to do it justice. I suspect that I will do so come the quieter, colder winter months. Anyway, this is how I came to be sitting outside my local convenience store this afternoon, complete with few of my favourite things in life. A good book, a cold beer, some chocolate, a freshly washed nectarine and a decent view. And for a few hours I’m transported from South Korea to the Channel Islands just post WWII. I love the way good books can do that, transport one so quickly and easily across time and country. A very civilised way of travelling. My first night evening in Venice, and we’re enjoying one of the best pizza’s of our lives at a surprisingly swanky restaurant considering the prices. Suddenly the door to the kitchen bursts out, and out storm the staff, weaving their way through the tables of customers out into the street. followed swiftly by all the waiters. Naturally, we follow, to see what all the fuss is about. It soon becomes clear. The bar across the alley has a TV. The TV is showing the MATCH. The Dutch, host of Euro 2000, are squared up against the Italians in the semi finals. Squandering numerous chances through the game, the Dutch are held nil – nil. Down to penalties. History will tell you the Italians won. I got my first glimpse of the famous Italian passion and emotion, with grown men crying in the streets, hugging and kissing all and sundry as they celebrated their good fortune and the win. It felt like Venice boiled over that hot summer evening, and the passion of the Italian men and woman was sight to behold, and led to a very special first night in Venice. I’m catching the overnight train from Milan to Brussels, and find myself sharing the cheap seats with two Spanish university students. Just weeks before, the Spanish had sent us tumbling out of the World Cup in Japan/South Korea, 3 – 2 if my memory serves correctly. I remember sneaking off work in the UK so that I could watch the game and suffer the anguish that South African sports fans know so well as we came so close, yet ultimately came up short. Yet for the two Spaniards, that game had been nothing special, just another minor obstacle on their way to bigger and better things later in the tournament. Hardly impartial, but I felt rather belittled the way they rather unceremoniously tossed my country to the soccer scrap heap. On these two experiences alone, I make my decision. For inadvertently giving a youngster like me a most fantastic introduction to Venice, and all things passionate one summer night in 2000, I hope the Dutch emerge victorious on Sunday at Soccer City, Johannesburg, South Africa. Bravo SA, you’ve done yourself and all your citizens proud over the last month. Lets finish this thing off with a bang.